Digital printers require digital media for best results. You wouldn’t confuse your large format digital printer for a vinyl cutter would you? Of course not. One produces spot color graphics by cutting paths in the face film. The other lays down droplets of ink that decorate the face film with stunning color images. And you wouldn’t try to plug an ink cartridge in your Graphtec plotter would you? Naturally not. Then why would you consider using sign plotter vinyl in your digital printer instead of digital printing vinyl? Here’s why that isn’t a good idea. Ecosolvent ink works by using heat and environmentally friendly solvents to penetrate the media so that the colorants are deposited beneath the surface. This is what gives it the outdoor durability the sign industry requires. Because of the concern for VOC’s and the environment, the solvents used in Mutoh’s Eco Ultra and our EnduraINK PRO inks are not as aggressive as those found in traditional solvent printers. So a heavy gloss or matte surface may hinder ink absorption. This reduced ink absorption causes degradation of both print quality and abrasion resistance. Therefore, images printed on a high gloss plotter film like EnduraGLOSS or ORACAL 651 will not have the sharp clarity and rich color of those printed on media designed for eco-solvent printers. And because too much of the ink is left on the surface, an installed print will be less UV-resistant and less abrasion resistant than it should be. It will fade too quickly and may scratch off too easily. Digitally printable vinyls like ORAJET or our PrismJET vinyls are designed specifically for solvent and eco-solvent inks and will produce good to excellent print quality and industry standard abrasion and UV resistance. There are also innovative technologies like air egress liners that aid in bubble free installation of large graphics. Given the advantages of using printable vinyl, why would a professional sign maker jeopardize the quality of his or her work by using sign plotter vinyl? The most probably reason is the perception of lower cost. I say “perception” because printing on plotter vinyl doesn’t really save much money. The SignWarehouse price for a 30″ x 50 yard roll of white ORACAL 651 sign cutter vinyl is $110.59. That equates to 29.5 ¢/square foot. A 30” x 50 yard roll of ORAJET 3651 digital vinyl costs $119.90. That’s only $9.31 more; a difference of less than 2 cents /square foot. 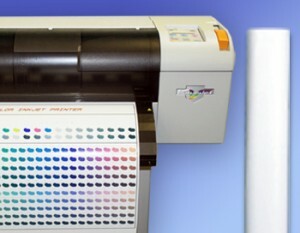 The same size in our popular PrismJET 203 glossy vinyl costs an only $95.00; fifteen dollars less than the plotter vinyl. So switching to the proper product doesn’t actually cost you any more. It may even save you quite a bit of money. Because of the demands of our times, there are plenty of good economy printable vinyls on the market for short term outdoor use. If you’re dealing with a penny-pinching customer, you can always choose an economy product like ORAJET 3640 or 3621 removable. A 30” x 50 yard roll of either product costs only $ 73.65 or 20¢/sf. Running solvent printable vinyl in your printer produces better print quality, better abrasion resistance, and better outdoor durability. Now consider the alternative. If you print on sign plotter film and the image doesn’t look professional or fades prematurely, the value to your customer is diminished. If their logo is on that print, their reputation is also damaged. And if they get negative feedback, your reputation will suffer as well. Your customers count on you for professional quality graphics. Don’t let them down by mistaking your digital printer for a vinyl cutter. * Some digital printers can use “sign cut vinyl”. Most of those are thermal resin printers like the Gerber Edge, Summa DC3 or Roland ColorCamm (Yes, there are still a few of those around). If you’re using one of these machines, a bright white glossy vinyl like EnduraGLOSS or ORACAL 651 is an excellent choice. But if your printer runs on ink cartridges instead of ribbons, you need to rethink your choice of substrates. Used or New… Which is the best buy?